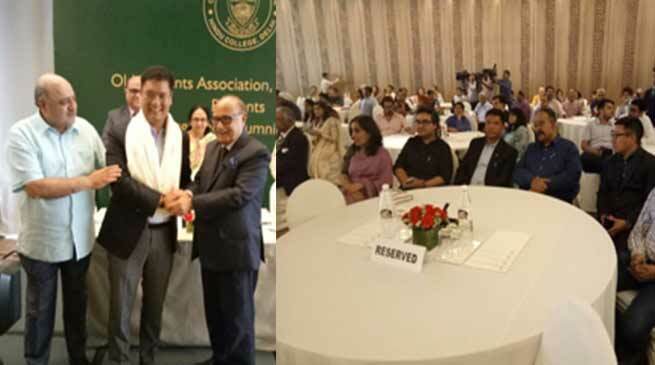 Arunachal Pradesh Chief Minister Pema Khandu was felicitated by the Old Students Association (OSA) of Hindu College among others who have been contributing for the nation in diverse field at the 16th Annual OSA Distinguished Alumni Award function here on Sunday. Khandu was felicitated with the distinguished Alumni award for excellence in public service while Justice Rekha Palli, Judge Delhi High Court was felicitated for excellence in law. Among others, Siddhartha Basu – TV Producer KBC/Quiz Master was awarded for excellence in media, Dr.Ashima Goyal,Economist, PM’s Economic Advisory Council for excellence in economics, Dr. Shekhar Agarwal, Orthopaedics Surgeon for excellence in medicine, Arjit Basu, MD & CEO, SBI Life Insurance Ltd for excellence in Corporate Sector, Vikram Misri, Ambassador to Mynamar for excellence in Foreign Service,Shrijeet Mishra, Executive Director Bennet Coleman for excellence in Corporate Sector, Sheela Chamaria, renowned sculptor for excellence in Fine Arts, Sudeep Sen, internationally renowned poet and writer for excellence in Literature, Raman Narula, Founder MD, Formula Group for excellence in Corporate Sector, Ritesh Shah, Films Screenwriter for excellence in Cinema and Dr.Harish Naval, Professor for excellence in education were felicitated in a glittering function at a city hotel. The OSA also felicitated young achievers like Dhruv Bedi, internationally acclaimed Sitarist for excellence in Music, Ajay Arora, IAS, visually handicapped officer for excellence in Civil Service, Milee Ashwarya, Editor, Commercial Books, Penguin Random House for excellence in Publishing andPrakash Singh, Senior Editor, Republic TV for Excellence in Media. The organiser conferred lifetime achievement awards to Ashok Lavasa, Election Commissioner of India and Prof. M K Jain, Professor Emeritus of Computer Science. The awardee Alumni of the prestigious college have distinguished themselves in their chosen field and brought laurels to the country, their respective states and the college. CM while recalling his days at Hindu College extended his gratitude to the institution for making him what he is today. “I am proud to be part of this prestigious college”, Khandu said. He on his personal capacity invited the Alumni Association of the college to hold a program at Itanagar where alumni of Northeastern States could participate. He further requested the Principal of the college to select a batch of 10 current students of the college for Arunachal Darshan, which eventually would help them in knowing the unique cultural diversity of the region, and promote cultural exchange and integration with rest of the country.